Jewish Journal, Brooklyn, New York. And we can take you there. already been at least once. nation, Israel is a place to see. "Israel needs us right now,"
Co-Chair, Dr. Raquel Bild-Libbin, Guest Speaker. Rose Steinman, Dorothy Shuken, Ann L. Cohen. ber, EiUen Talkov, Isabella Fink, Selma Legman. in the development of YAD. diligently to reach their goals. haron. Background: Mr. Grabler's wife, Norma. mation will follow in the next issue of The Floridian. ten or fifteen years ago,"
has endorsed the exclusionary move. Israel as well as a denunciation of terrorism. and lends support to" acts of terrorism. session will be held in Geneva. The State Department allows how the U.S.
have been accorded privileges since 1975.
branch and a freedom fighter's gun," the U.S.
weapons of terrorism in the other." sufficient for only one day. oil, such a big festival?" radio to speak to his country. wear it as a badge of honor." that Judaism is alive and well. was granted a last wish. over the grave of Pilsudski,"
over the grave of Magaryk,"
We Jews continue to wait. as well as defense imports. years will occur in the sports arena. championship Red Army sports club. rematch in the Yad Eliahu stadium. elliptical orbit around the earth. assess various components of the Jewish community. countries, which have no diplomatic relations. "It looks like an Orthodox kibbutz." Your gift to The Endowment Fund ensures that your good works will continue. and be remembered for having improved your community and your world. complete and return the following Letter of Intent. the future of the Jewish people. of Palm Beach County, (407) 832-2120. Endowment Fund of the Jewish Federation of Palm Beech County, therefore. This letter of Intent Is not a legal obligation and may be changed at my discretion at any time. O I would like a representative of the Endowment Committee of the Federation to meet with me or my attorney. The Federation appreciate* your participation end will *nd tha s loner a photocopy ot Hits letter ot Intent for hie or her personal file. D Philanthropic Fund a Please call me. cisco, St. Louis and Denver. regarding the "Who Is A Jew"
rabbis in the United States. ity with and for Israel." Agudat Yisrael party in Israel. -We Also Do Vertical Blind Repairs"
2215 N. MILITARY TRAIL, SUITE K, W.P.B. force is meeting on an action plan to accomplish this goal. approach to the issue of "Who is a Jew." and that they will seek to enforce the Covenant. form a government and thereafter. the year in Atlantic City, N.J.
and half in West Palm Beach. to Jewish causes and Israel. Stein, advisor to the U.S.
omy and nobel laureate Prof.
Doron states that it is not.
' "P "-EISCHMANN s a^'e'0"'^ . An unbelievable $1499.00 per/person (based on double occupancy). Your trip of a lifetime is available only through Jewish Federation of Palm Beach County. folk artists in South Florida. Center in the Soviet capital. usually meant a schlep to the bagel shop. Now, just go to your freezer for a Lender's"
crusty, and tastes like a bagel shop bagel. half the calories of butter or margarine. fast tradition to your family today. Bagel Bakery CMS Depi *21000. I Fawceti Dr.
there were Jews that far West. black ones everybody else had. "Right, they cost a fortune,"
Chanukah's so e?-ly this year! you tomorrow on the bus! tal images into the real thing. from these bits of wax? dle dolls to keep her company. bee: black hair and a tunic top. door. Oh no! Mom and Adam! She couldn't let them see! morning, you ran out so fast. orange spots on its tail." secret from Debby and Kris. adorable! I just love them! sidered offering them for sale? and Debby in the same breath. Japan, Switzerland or the U.S.
business in Israel as well. public about free market idea. distance rates within your calling zone are as ^much as 27% lower. Call on weekends or after 11 p.m. and save even more. Rates listed above are in effect 5-11 p.m., Sunday-Friday. kah or Purim," he said. Jewish community to prove it. Is There A Chanukah Tree? after the exodus from Egypt. olive oil of pounded olives." as the miracle of Chanukah. its upper side is dark green. orah with the oil from olives. and has a residence in St.
Abstract of Israel for 1988. 78,000 Druze, at 1.7 percent. 2.85 between 1983 and 1986.
nity for a more secure, productive life. U.S. Congress elected on Nov.
up and he raises his hand. event of war with Israel. is accepted. Pupils tutored by Technion students consistently show improved grades. All platters are sold by the pound $6.00/lb. Effective in Dade. Brward. Palm Beach. s% December 14, 1968. Quantity Rights reserved. MUDliX Only in Dade. Broward. Palm Beach. Martin. St. Lucie. Indian River and Okeechobee Counties. holidays and birthdays. Come. Visit our home. Bath time for our first house dog. Site clearing. Driveway palms removed. Our rose garden is dedicated. Older Americans Month proclaimed. The first concrete is poured. 5th Anniversary "Roarin' 20s" party. The chapel and lobby walls tumble down. 28 five-year staffers honored at dinner. Forms for new walls go up. We pray in the sukkah. Our expansion is one-third comvleted. Dec. 9 Free Sons of Israel, board, 10 a.m.
tion Aitz Chaim Sisterhood, Luncheon/Show, 10:30 a.m.
Indian Springs Mini-Mission, 8:30 a.m.
p.m. Yiddish Culture Group Century Village, 10 a.m.
Herzl, board, 10 a.m. B nai B'rith Century, 7:30 p.m.
Central Planning & Allocations Committee, 5:30 p.m.
Chase Lakes Mini-Mission, 9 a.m.
Executive Committee, 7:30 p.m. and Board, 8 p.m.
Council, board, 10 a.m. Hadassah Z'Hava, 1 p.m.
Eisenberg of Temple Beth Sholom. Listener's Digest, a radio magazine. TRADITION TIME Sunday, December 11, 11 p.m.
Jewish music, comedy, and news. brightly colored skeins of yarn. and the Six Day War in 1967.
class to the anti-Semitic act. Minimum commitment $550.00 plus couvert chary* $80.00 per person. 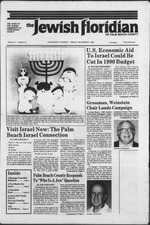 Graham Is 1988 "Legislator Of The Year"
Torah as a Bar Mitzvah. a poster of Israel had "Israel"
rights in the Soviet Union. the 1988 fire season in April. West Bank and the Gaza Strip. "The response of the U.S.
state police on the matter. Carole Farrington at the Center, 471-5111.
vowed to pressure the U.S.
ing for a change in the U.N.
activities will be scheduled throughout the year. vices of Legal Aid Society. Fee is $1 each one way trip. ter the finer points of writing? days at 9:30 a.m. at the JCC. Thursdays at 10 a.m. at JCC. ber will be a Latke party. session leader for Dec. 12. You Name It, You Play It! sored by 2nd Tuesday Council. leaves Carteret Bank at C.V.
join us for a hot Kosher lunch. tions must be made for lunch. sion "Wisdom of the Body"
wards, we'll all go out to dinner. bountiful bonfire together. Bring blankets if you'd like. Rubino's in the Sheraton Hotel on Palm Beach Lakes Blvd. For more information, call the JCC at 689-7700.
sters in Israel and in S3 other countries around the world. ing Israel to all other U.N.
8 p.m. in the Village Hall. eral meeting on Tuesday, Dec.
guest speaker is Carolyn M.
Jack, well known drama critic. could cost Israel $36 million. approval to make such a cut. he run to me, I fear for my life. I felt I had to defend myself." spat on his wife three times. courts and levied upon him,"
is a question of whether a U.S.
AND OUR JEWISH HERITAGE ALIVE. & A.M. to 6 P.M.
services 8:30 a.m. and 6 p.m. Saturday 9 a.m. and 6 p.m.
West Palm Beach 33411. Phone 689-9430. Rabbi Joseph Speiser! 9 a.m. For times of evening services please call the Temple office. Abraham Mehler. Services Friday 8:15 p.m., Saturday 9 a.m.
Brody. Sabbath services Friday 8:15 p.m., Saturday 9:30 a.m. Rabbi Morris PickhoU. Cantor Andrew E. Beck. 287-8833. Services Friday evenings 8 p.m. and Saturday 10 am. Palm Beach 33417. Phone 686-5055. Sabbath services 8:45 am. 747-1109. Services Friday 7:45 p.m.
tion would "pull no surprises"
the sales of American arms. said he was "pretty confident"
that the current level of U.S.
p.m. followed by the meeting. munity on the World Stage,"
be served at 9:15 a.m.
holz and Cantor Andrew Beck. ZOLINE. Sam, 92, of Palm Beach. SHULMAN, Alice, 74, of Lake Worth. tion Plan Chapel, Delray Beach. Beth Tikvah at Manor Care is a great place to work! f aim I Each lihnrmcal Culture foundation, Int. mecei by MATTHF.w lAZAR p,us New York., Outstanding ZAMIR CHORALE CANTOR DANIf:L CILDAR ""'"""""""
Balcony Reserved Seats $15 00 ea. "Max, tonight (3/15/88) you have made history!"